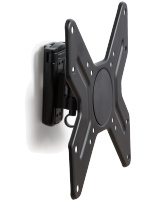 Inexpensive Monitor Stand for 19" LED TV Mounts to the Wall to Keep Floor Space Clear! 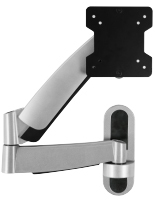 This Monitor Stand Includes Arm Extenders for Larger Flat Panel TVs! Check Out All the Television Stands We Offer! 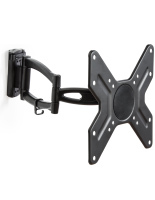 The LCD mount, discount monitor stand for 19" flat panel LED TV brackets has stylish black plastic coverings for keeping the mounting screws concealed and out of sight. 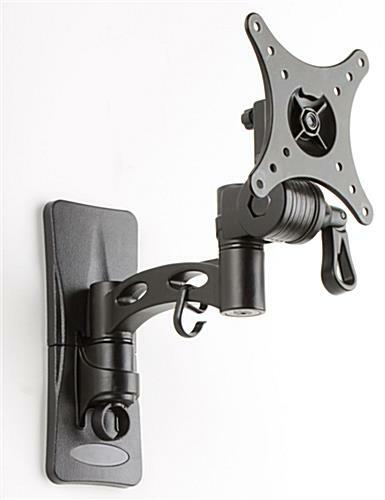 A plasma mount, monitor stand has an articulating arm that enables you to position your monitor exactly where you want it. 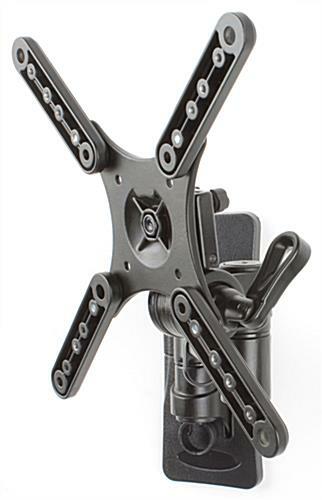 This articulating arm allows you to tilt the screen down for a better view. 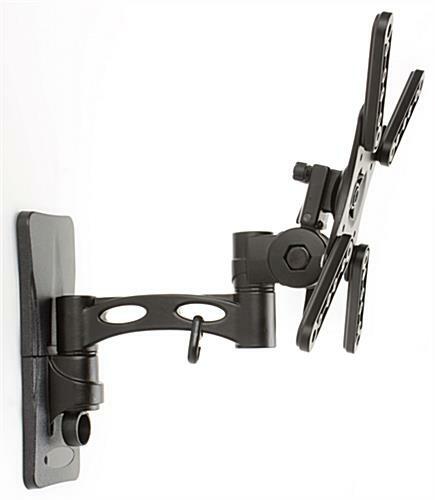 The large range of motion provided also permits you to tilt your monitor down 20° and extend the arm outward 9-1/8". 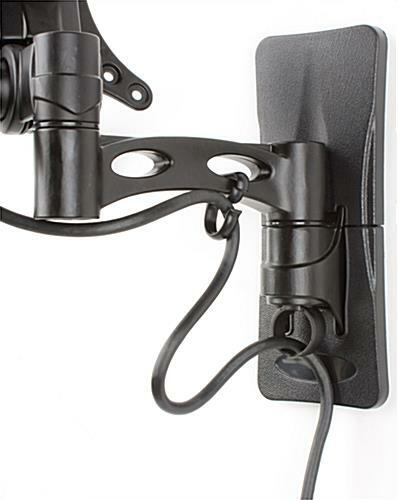 This monitor stand has clips that hold wires coming from the monitor to the arm to keep them neat. This monitor stand can hold a 10" to 42" plasma or LCD television that weighs up to 55 lbs. 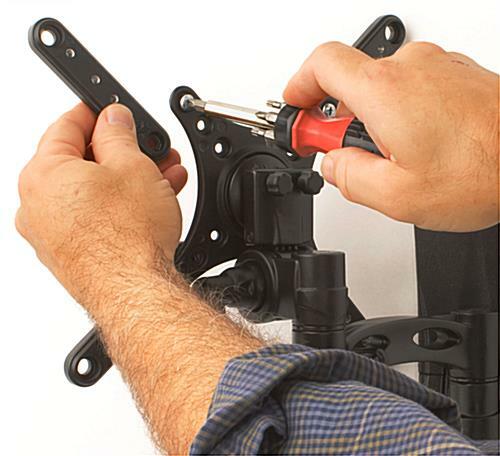 Included with the plasma mount is all the necessary hardware to mount most televisions; however, some may require certain screws that can be purchased at any local hardware store. 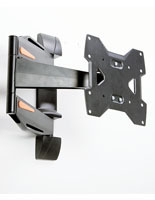 This monitor stand, also known as a plasma mount and an LCD mount, is compatible for VESA standard 50 x 50 to 100 x 100. 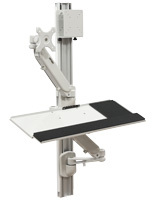 This monitor stand also has extending arms for up to VESA 200 x 200 to fit larger screens. 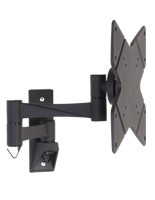 The VESA brackets are engineered to support a variety of TV brands including Toshiba, Panasonic, Sony, Vizio, LG, and NEC. 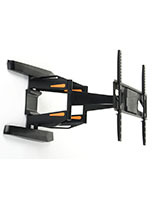 Buy monitor stands for 42" wide screen TVs in bulk or individually!